WHAT DOES RESORT ENTRY PAY FOR? When visiting Falls Creek in winter a Resort Entry fee is applicable for your stay. Entry outside of the snow season is completely free. Resort Entry fees are an important part of resort operations, funding essential services such as Ski Patrol, Snow Clearing, Guest Services and much more. Resort Entry is charged at a cost per vehicle for the duration of your stay. For all short term visits you can buy a Resort Entry Pass at $49.50 per day when bought online. Purchases made at the Resort Entry gate will cost $54 per day. Remember to print your pass before leaving home (it will be attached to your confirmation email). If you forget to do this you can print your pass at the ticket desk at ATS or Visitor Information. Do not stop at the Ticket Box as this service is not offered. Passes bought online are around 10% cheaper than buying at the gate. They also allow the best convenience. Simply print out the attachment in your confirmation email and display in the windscreen when you park – this means no stopping at the Ticket Box so it saves you time as well as money. We’ve made some changes to how we do Resort Entry Passes. Gone are the Day vs Night and Morning vs Afternoon variations. 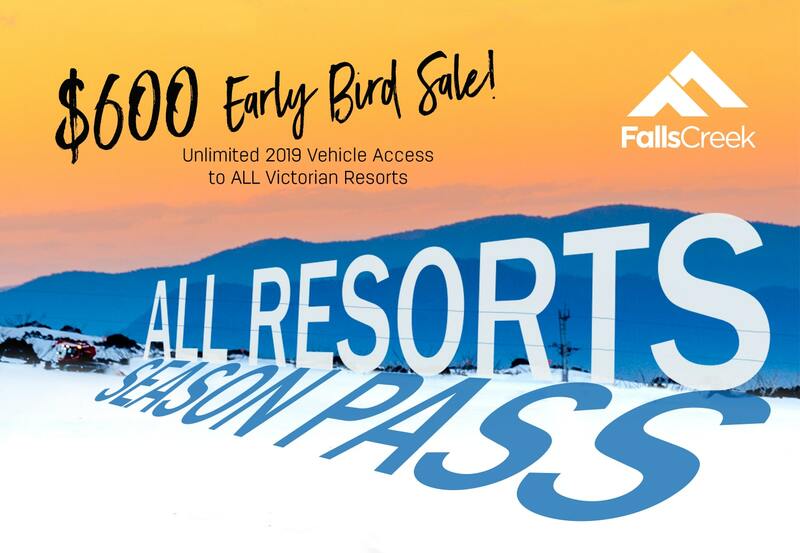 In season 2018 you need to purchase just one Pass for access to Falls Creek, no matter when you arrive or how long you plan to stay. Resort Entry Passes in 2018 will be charged at $49.50 per day bought online, or $54 purchased at the resort. Resort Entry between 5pm and midnight is completely free. This system is simpler and easier to understand. Having one pass makes it easy when booking Resort Entry and you don’t need to figure out which category of Pass you need. Do I need a different pass to stay overnight? No, the Resort Entry Pass covers day trips and overnight stays, but you do still need to park in appropriate day or overnight parking areas. Do I need to stop at the Ticket Box? Not if you purchase online. Print your Pass at home and you can then drive straight through to the resort to self-park in Day parking or be assisted to an Overnight parking area by our parking crew. I bought online but didn’t print my ticket, what do I do? Don’t stop at the Ticket Box – you can visit the help desk at either the ATS Terminal or Visitor Information Centre to have your pass printed. This will likely be subject to wait times so it’s best to remember to print your Pass at home. Can I just visit for dinner or night skiing? Yes, access is free every night from 5pm to midnight and you can park in day-parking areas. You do still need a pass on your vehicle so pick one up for free at ATS or by booking online. Why do I have to pay Resort Entry? There are a many services that are simply essential for an alpine resort to operate in winter, things like Ski Patrol, sewage treatment and snow clearing. Your Resort Entry fees go toward funding these important functions to make a snow season as you know it possible. This infographic gives a good understanding of everything your Resort Entry Fees go towards funding. Between the dates of June 28 and September 10 (inclusive) Falls Creek village is closed to vehicles to allow for our unique ski-in ski-out environment. Outside of these dates, if the roads are clear of snow then vehicles are able to access the village for 30 minutes to pick up or drop off people and luggage at your accommodation. Please note, this is for the village roads only - the Bogong High Plains Road is cleared of snow daily and open to all vehicles 24/7. Visitors 65 and over receive a 20% discount rate on Short Term and Season Resort Entry Passes. The person over 65 must be the driver of the vehicle but there are no restrictions on the ages of other passengers in the vehicle. Proof of age is required for this discount so Short Term Passes are available to purchase at the resort only (no online sales). Season Passes are still able to be bought online but will not be issued until Proof of Age (ie: Drivers License) and Proof of Ownership of Vehicle (ie: Registration papers) are presented to FCRM. These documents can be scanned and emailed to [email protected] to speed the application process. Otherwise, present these in person at the Ticket Box, ATS Terminal or Information Centre when you pick up your Pass. IS ONE TRIP NOT ENOUGH? A Season Pass offers the best value if you plan to visit Falls Creek for 9 days or more. With a Season Pass you can visit as many days as you like and avoid stopping at the ticket box as you drive to the Village. Buying a Season Pass online costs $475 (or $380 for over 65's). Once you have your Season Pass there is no need to stop at Resort Entry, drive direct to the village and either self park for the day of let our parking staff help you to an overnight park to get out on the snow with no delay. When arriving by bus Resort Entry is included in the cost of your ticket so you don't have to worry if travelling on a commercial service. Driving your own bus (any vehicle with 13 seats or more) is charged at $18.50 per person or $9 for children 5-17 & school groups. This is charged per entry so there is just one charge if you stay in Falls Creek or one charge per day if staying off-mountain. Trailers and Motorbikes are permitted at $15.50 per day but may not be granted entry at times when snow chains are being fitted. Check the Snow Report before leaving home to be sure that conditions allow for these types of vehicles. To apply for concession access, Schools must provide written evidence that the trip is part of the school’s curriculum, and that all pasengers are enrolled in an officially recognised education course. This evidence should be presented on a school letterhead, signed by the principal or authorised delegate & presented with payment on the day of arrival. Under section 22 of the Act, the Supplier is entitled to ask you to agree that these statutory guarantees do not apply to you. If you enter the Resort and thereby accept these terms & conditions, you will be agreeing that your rights to sue the Supplier under the Act if you are killed or injured because the services provided were not in accordance with these guarantees, are excluded, restricted or modified in the way set out in these terms & conditions. NOTE: The change to your rights, as set out in these terms & conditions, does not apply if your death or injury is due to gross negligence on the Supplier's part. Gross negligence, in relation to an act or omission, means doing the act or omitting to do an act with reckless disregard, with or without consciousness, for the consequences of the act or omission. See regulation 5 of the Australian Consumer Law and Fair Trading Regulations 2012 and section 22(3)(b) of the Australian Consumer Law and Fair Trading Act 2012. (b) use of the Resort and facilities, and any activities carried out by the Permit Holder, whilst at the Resort. The Supplier may in its sole discretion issue Permits for entry into the Resort subject to the conditions set out below. Each Permit entitles the Permit Holder to access the Resort during the period stipulated on the Permit. The price of the Permit is the amount set out at www.fallscreek.com.au/ResortEntry from time to time. No Permit will be issued unless and until the Supplier has received payment of the price in full. The Permit must be affixed to the lower driver’s side of the front windscreen of the vehicle listed on the Permit and with the expiry date clearly visible prior to entry into the Resort – (Regulation 11. (3) Alpine Resorts (Management) Regulations 2009). (d) must be collected from Howman’s Gap Resort Entry Ticket Box at Howman’s Gap or posted to Permit Holder. 7. The Supplier may at its discretion withdraw or cancel any Permit if it determines, in its reasonable opinion, that a Permit Holder has breached any of these terms & conditions. 8. No replacement or refund will be made for loss of Permit, in the event of poor snow conditions, or if any lift service or other facility is not operating or open. The Supplier will not under any circumstances provide a refund for Permits purchased online. (c) all signs (including during hours of darkness) or other directions of the Supplier or any of its employees and agents. 10. People over 65 are eligible for a 20% discount (Over 65's Discount) on the purchase price of the Permit at the time of purchase. Proof of age must be presented by the purchaser in order to purchase the Permit at the discounted price. The Over 65’s Discount does not apply to bus, taxi, trailer, motorbike, driver only or Accommodation Transfer Service products (details of which are available on the Supplier's website at www.fallscreek.com.au/ATS). No Registered Postage is available on purchases made using the Over 65's Discount. 11. Vehicles must not be left in a position to cause any obstruction to footpaths or roads. (d) the Permit Holder releases its employees, directors, officers, contractors and agents from any loss, damage or liability in negligence, equity, breach of contract or statute or statutory duty to the Permit Holder, howsoever incurred by the Permit Holder which is not otherwise dealt with in clause 12(c). The Supplier holds the benefit of this clause 12 for itself and on trust for each of its employees, directors, officers, contractors and agents. 13. The Australian Consumer Law (as set out in Schedule 2 of the Competition and Consumer Act 2010 (Cth)) provides Consumers (as that term is defined in the Australian Consumer Law) with a number of protections and Consumer Guarantees that cannot be excluded or limited. These terms & conditions, and in particular the limitations of liability set out in these terms & conditions, are therefore subject to, and will not apply to the extent that they limit or exclude, such protections and Consumer Guarantees applicable to Consumers. However where the Australian Consumer Law permits the Supplier to limit the remedies available to it in respect of the customer for a breach of a Consumer Guarantee, the Supplier hereby limits its remedies to the customer, at the Suppliers' option, in the case of goods, to the repair or replacement of the goods, the supply of equivalent goods or the payment of the cost of having the goods repaired or replaced or having equivalent goods supplied and, in the case of services, to supplying the services again or paying the cost of having the services supplied again. NOTE: The change to your rights, as set out in these terms & conditions, does not apply if your death or injury is due to gross negligence on the Supplier’s part. Gross negligence, in relation to an act or omission, means doing the act or omitting to do an act with reckless disregard, with or without consciousness, for the consequences of the act or omission. See regulation 5 of the Australian Consumer Law and Fair Trading Regulations 2012 and section 22(3)(b) of the Australian Consumer Law and Fair Trading Act 2012. (b) use of the Resort and facilities, and any activities carried out by the Pass Holder, whilst at the Resort. The Supplier may in its sole discretion issue Season Pass for entry into the Resort subject to the conditions set out below. Each Season Pass entitles the Pass Holder to access the Resort during the declared Snow Season as stipulated on the Season Pass. The price of the Season Pass is the amount set out at www.fallscreek.com.au/Resort Entry. No Season Pass will be issued unless and until the Supplier has received payment of the price in full. An “Early Bird offer” discount is available where the purchaser has submitted an online purchase and completed 2nd instalment payment 6 February , 2019. The Season Pass must be affixed to the lower driver’s side of the front windscreen of the vehicle listed on the Season Pass and with the expiry date clearly visible prior to entry into the Resort – (Regulation 11. (3) Alpine Resorts (Management) Regulations 2009). Season Passes are only available in respect of privately registered motor vehicles (less than 13 seating capacity), excluding commercial motor vehicles. Commercial motor vehicles include any motor vehicles which are used or intended to be used for carrying passengers for hire or reward. All Resorts Season Passes (which enable resort entry into the Resort as well as the resorts at Mt Hotham, Mt Buller, Mt Stirling, Mt Baw Baw and Lake Mountain) are available for purchase from the Supplier and for the price set out at www.arcc.vic.gov.au/news#allresorts. The price of an All Resorts Season Pass includes the cost of a Season Pass. The All Resorts Season Pass shall only be accepted as valid when displayed with the valid resort specific season pass, both of which must bear the same vehicle registration number. All Resorts Season Pass holders will be subject to the relevant resort’s terms and conditions of entry, during season of issue, available on the relevant resort’s website. Where a vehicle with a Season Pass is sold, damaged or the windscreen broken, the Season Pass must be removed and the Season Pass (or as much of the Season Pass that remains intact, which if possible should include the Pass number) returned to the Supplier for issue of a replacement. Season Pass are not subject to a refund in such an event. A replacement Pass will only be issued to a vehicle registered in the same name as the original Pass and proof of ownership via registration papers must be produced. A replacement fee of $30.00 will apply. (d) must be collected from [and returned to] Falls Creek Visitor Information Centre, Howman’s Gap Resort Entry Ticket Box or posted to the Purchaser. The Supplier may at its discretion withdraw or cancel any Season Pass if it determines, in its reasonable opinion, that a Pass Holder has breached any of these terms & conditions. No replacement or refund will be made for loss of Season Pass, in the event of poor snow conditions, or if any lift service or other facility is not operating or open. The Supplier will not under any circumstances provide a refund for Season Passes purchased online. People over 65 are eligible for a discount rate as nominated at www.fallscreek.com.au (Over 65s Discount) for purchase of the Season Pass at the time of purchase. Proof of age must be presented by the purchaser in order to purchase the Season Pass at the discounted price. The Over 65’s Discount does not apply to bus, taxi, trailer, motorbike, driver only or Accommodation Transfer Service products (details of which are available on the Supplier’s website at www.fallscreek.com.au/ATS). No Registered Postage is available on purchases made using the Over 65’s Discount. Vehicles must not be left in a position to cause any obstruction to footpaths or roads. (d) the Pass Holder releases its employees, directors, officers, contractors and agents from any loss, damage or liability in negligence, equity, breach of contract or statute or statutory duty to the Pass Holder, howsoever incurred by the Pass Holder which is not otherwise dealt with in clause 16(c). The Supplier holds the benefit of this clause 16 for itself and on trust for each of its employees, directors, officers, contractors and agents. The Australian Consumer Law (as set out in Schedule 2 of the Competition and Consumer Act 2010 (Cth)) provides Consumers (as that term is defined in the Australian Consumer Law) with a number of protections and Consumer Guarantees that cannot be excluded or limited. These terms & conditions, and in particular the limitations of liability set out in these terms & conditions, are therefore subject to, and will not apply to the extent that they limit or exclude, such protections and Consumer Guarantees applicable to Consumers. However where the Australian Consumer Law Passes the Supplier to limit the remedies available to it in respect of the customer for a breach of a Consumer Guarantee, the Supplier hereby limits its remedies to the customer, at the Suppliers’ option, in the case of goods, to the repair or replacement of the goods, the supply of equivalent goods or the payment of the cost of having the goods repaired or replaced or having equivalent goods supplied and, in the case of services, to supplying the services again or paying the cost of having the services supplied again. Season Passes must be collected at the Howman’s Gap Resort Entry Ticket Box or from the Supplier’s office at 1 Slalom Street, Falls Creek, or posted to the Purchaser. Restrictions apply to the use of trailers in resort. Vehicles with trailers must pay a trailer fee and will be required to park at Howmans Gap unless prior authorisation has been received. 2.1 People over 65 are eligible for a discount rate as nominated at www.fallscreek.com.au/resort entry (Over65’s Discounted) for purchase of the Season Pass at the time of purchase. Season Passes with discounts are available online but will not be issued until proof of age and vehicle ownership is provided. Please Note Short Term Resort Entry tickets are not available at the discounted rate online. 2.2 Passes must be collected at the Howman’s Gap Resort Entry Ticket Box or from the Falls Creek Resort Management office. No Registered Postage is available on Over 65’s product purchases. Season Passes are only valid for the registered vehicle, if you are entering with a trailer you must stop at Howmans Gap ticket office or ATS to purchase a pass for your trailer. Subject to road conditions. All signs must be obeyed at all times. All directions from Falls Creek Resort Management must be obeyed at all times. Season Passes do not allow village access, only exception is during periods of low or no snow on the village roads, Falls Creek Resort Management may determine to allow access for 30min baggage dropoff. People aged 65 and over at the time of purchase are eligible for a discount rate as nominated at www.fallscreek.com.au/resortentry (Over65’s Discounted) for purchase of a Falls Creek Resort Entry Season Pass. Season Passes with discounts are available online but will not be issued until proof of age and vehicle ownership is provided. Please Note Short Term Resort Entry Passes are not available at the discounted rate online. Passes must be collected at the Howman’s Gap Resort Entry Ticket Box or from the Falls Creek Resort Management office. No Registered Postage is available on Over 65’s product purchases. Over 65's Resort Entry Season Passes are subject to all terms and conditions of a Resort Entry Season Pass.